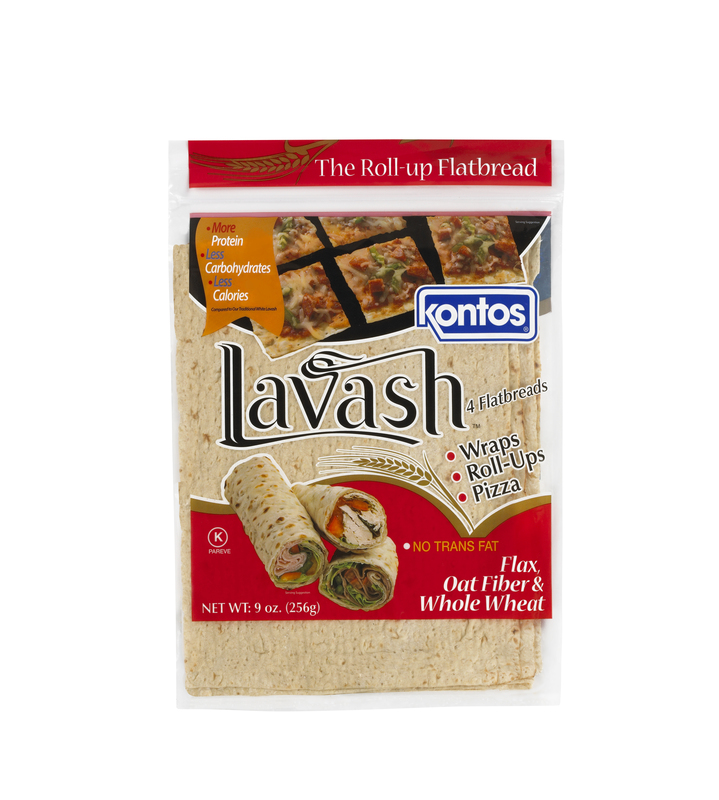 Flax, Oat Bran and Whole Wheat Lavash - Kontos Foods Inc.
-inch rectangular) flatbread which rolls in both directions. Because it is yeast based, it will absorb moisture and not fall apart. May also be used to make ‘pinwheels’ for appetizers. Contains No Trans Fat, and is 100% Vegetarian. UPC code 0-32394-11045-4 Ship Weight 12.5 Lbs. Ingredients Water, Whole Wheat Flour, Wheat Gluten, Oat Fiber, Corn Starch, Flax, Soy Protein Isolate, Defatted Soy Flour, Soybean Oil, Enriched Wheat Flour (Wheat Flour, Niacin, Reduced Iron, Thiamine Mononitrate, Riboflavin, Folic Acid), Sesame Seed Flour, Salt, Calcium Sulfate, Sodium Acid Pyrophosphate, Calcium Propionate (a preservative), Oat Bran, Dextrose, Sodium Bicarbonate, Potassium Sorbate (a preservative), Fumaric Acid, Monoglycerides, Hydrogenated Soybean Oil, Sodium Metabisulfite, Yeast, Enzymes, and L-Cysteine.